Diffusion International Ltd aims to help individuals, teams and organisations succeed by excelling in performance. The company delivers consultancy, facilitation, development, training and coaching across many different industry sectors, from individual through to board level. Diffusions areas of expertise include business development, sales, leadership development and management, organisational planning and delivery, and team performance and effectiveness. 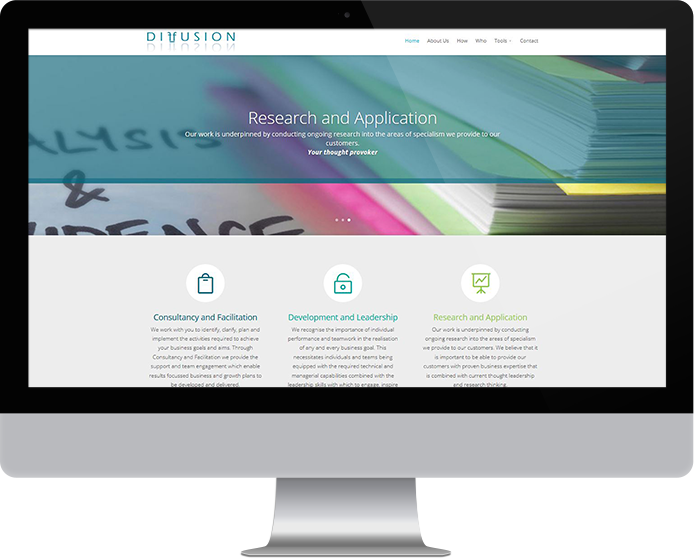 Our brief was to deliver a new website which clearly presented Diffusion’s services in a professional style. A vital element of the website was that it needed to be easy for users to find the information they were looking for. Therefore, we spent a great deal of time on refining the design to be clean and uncluttered, while the navigation was developed to be as intuitive and user-friendly as possible. This meant that even though there is a large amount of content on the website, users can quickly and easily find what they’re looking for. The content was provided for us by the client, who used a high-end consultancy firm that deals with large corporate communications. We worked carefully to ensure the content and design worked seamlessly together to create a satisfying user experience. The resulting website is clean, uncluttered and easy to navigate. It presents a clear and professional image, which reinforces the Diffusion International Ltd brand.